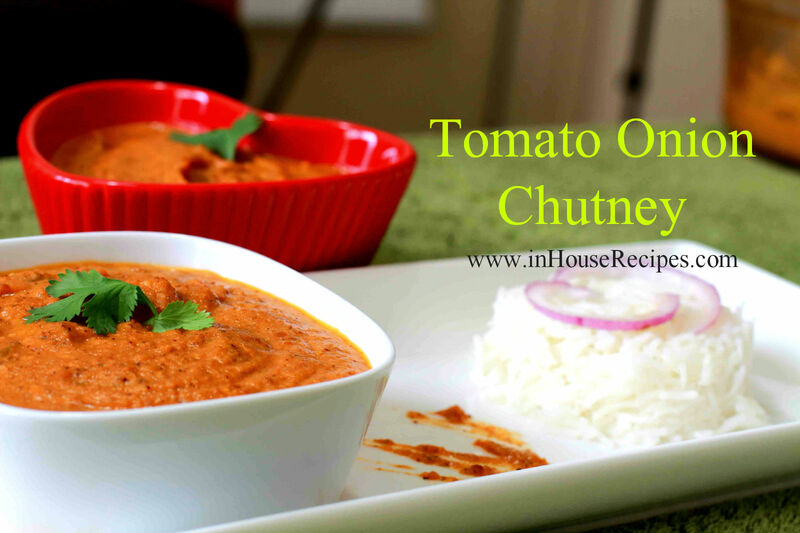 This Tomato Onion Chutney is seriously a delight to have. It has all the ingredients to be called a main course dish a Sabzi but we smartly give it a chutney look and feel. Due to its flavor and ingredients, you can enjoy it with rice, chapati or paratha without even having a sabzi. We got this recipe from Maahi’s friend Sushila and we have simply fallen in love with it. Give it a try and chances are that you will also make it a permanent member of your kitchen’s menu. Switch on the stove on high flame. Heat Oil in a pan. Once Oil is hot, add Dry Red Chili, Fenugreek Seeds, Mustard Seeds, Cumin seeds, Urad and Chana Dal, Curry Leaves, Hing, Coriander Seeds. Fry them on high flame until they achieve golden brown color. Stir continuously. Once it turns light golden in color, switch Off the stove. Take out all the fried ingredients in a plate and leave the left-over Oil in the pan itself. Add chopped Onions in the same left-over Oil and fry on high flame. After 2 minutes of frying, turn the stove to medium flame. Take out the Onion in a bowl and keep aside. 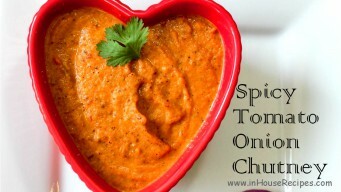 Add 3/2 Tbsp Oil, chopped garlic, chopped green chilies and chopped Tomatoes in the same pan. Turn the stove to high flame and roast until Tomatoes become soft. Now let me share the role of these 2 un-cut chilies with you. This chutney taste best when it is a bit Crunchy and Spicy. The Green chilies we roast in Oil, add less of spice add more of flavor to the chutney than the spice. If you like to eat spicy, then add these two un-cut chilies while grinding in the end. If you like less spicy, then simply add chopped Green chilies in Oil only. Do not add un-cut chili in the end while grinding. After 4 minutes, switch off the stove. Take out the Tomatoes in a bowl and keep aside to cool down. Now its a time to grind all the ingredients and make chutney. First of all, we will grind all the fried spices and Onions. To make it more spicy, add 2 un-cut Green chilies now and roasted tomatoes as well and grind once again. Take out the Chutney in a big bowl. Add the most important ingredient now: Salt 1-1/2 Tsp. I would like you to taste the Salt at this point. You can add more salt if you feel it is less, as per your taste. Tomato Onion Chutney is now ready to serve. 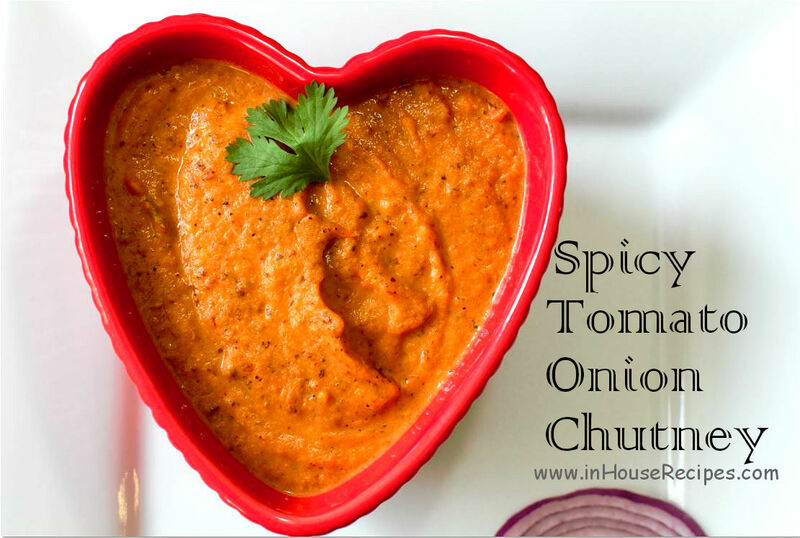 This chutney can be refrigerated up-to 5 days for good taste. 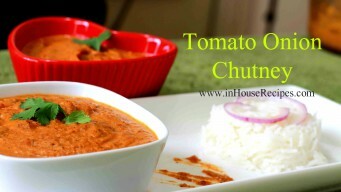 Serve this chutney with Idli, Dosa, Paratha or even boiled rice. We have in-fact tried to substitute it as a main sabzi and found it really appealing in dinner.